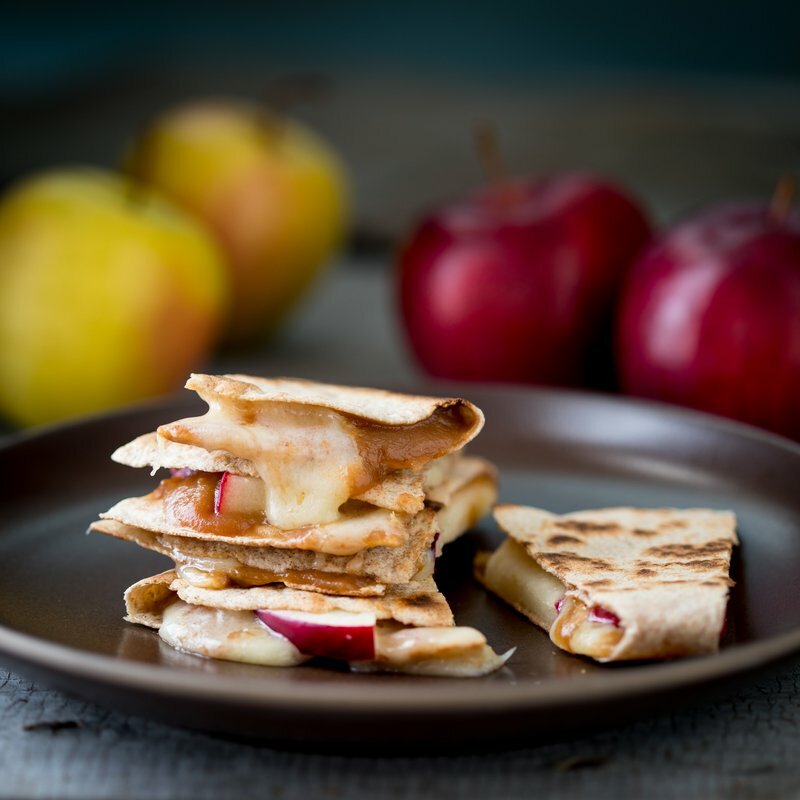 For the perfect healthy snack that adults and kids will enjoy, try this apple quesadilla recipe. Thinly sliced apples, Cabot Cheddar Cracker Cuts and apple butter are sandwiched between whole-grain tortillas and then cooked in a skillet until the cheese is melted. Once done, cut into wedges and enjoy! It’s a healthy snack that’s quick to make and delicious to eat. Feel free to share this easy quesadilla recipe with friends and family on Facebook, Pinterest, Instagram, and Twitter! Start by laying tortillas on your work surface. Spread the apple butter over half of each tortilla and top with Cabot Vermont Sharp Cheddar Cracker Cuts (or your favorite flavor of Cabot Cheddar Cracker Cuts) and apple slices. Fold tortilla over to make half-moon shapes. Place quesadillas in a dry, non-stick or cast-iron skillet that’s large enough to fit both quesadillas back-to-back. Set over medium heat and cook until the quesadillas are browned on the bottom, approximately 5 minutes. Carefully flip over and continue cooking until the other sides are browned and the cheese is melted, about 2 to 4 minutes. Cut into wedges and serve! Want to start your day with some scrumptious quesadillas? We’ve got just the recipe for you! Try our addictive Apple Cinnamon Breakfast Quesadillas - they’re sure to become a breakfast favorite! As a co-operative of over 800 farm families, our goal is to make the highest quality and best tasting dairy products you’ll find. We’d love for you to rate and review this apple quesadilla recipe once you’ve made it! LAY tortillas on work surface. Spread apple butter over half of each tortilla. Top with Cabot Cracker Cuts and apple. Fold tortilla over, making half-moon shapes. PLACE quesadillas in a dry non-stick or cast-iron skillet, large enough to fit both quesadillas, back to back. Set over medium heat. Cook until the quesadillas are browned on the bottom, about 5 minutes. Carefully flip over, and continue cooking until the other sides are browned and the cheese is melted, 2 to 4 minutes. Cut into wedges and serve. Absolutely delicious! I only had Pumpkin Butter on hand, but that made for a very nice substitute. I am sure the apple butter would be just as good. I had this for a late breakfast on a Saturday morning. Hit the spot!